This is a yearly tradition. This year is particularly important as it is a mid-term score-card (the mid point in a term of four years of the elections cycle). A self-assessment report by the Federal Government (FG) of its performance was launched earlier today. Some of the achievements claimed by the FG include: reducing Nigeria’s dependence on crude oil as its major export, to “only” 70% of it’s exports, stable exchange rates and improvement in transport infrastructure (roads and rail). An interesting assessment of the Federal Government’s performance was published by Vanguard Newspaper HERE. The key areas the government is rated on are infrastructure (mixed), power (weak), the economy (mixed), energy and gas (weak), security (weak), education (weak) and agriculture (favourable). The report also classifies some states as the “super rich states” such as Lagos, Akwa Ibom, Rivers, Delta and Bayelsa, and some as “scrounging ones” such as Zamfara, Osun, Ebonyi and Ekiti, where money is scarce. I am not sure if there’s a direct link between this and democracy. However, Nigeria’s movie industry which includes Nollywood and to a lesser extent, Kannywood, the Hausa movie industry up north, has grown exponentially in the last decade. Nollywood is now the 3rd largest movie industry in the world after Hollywood and Bollywood. Similarly, Nigerian artistes like D’Banj, P-Square, Wizkid, Banky W, Tiwa Savage have been making waves all across the world, clinching international music awards, collaborating with US artistes such as Snoop Dogg and Kanye West, featuring in global charts and recording many other impressive feats. Recording an average of 7.4% economic growth over the past decade, according to the IMF, Nigeria is one of the fastest growing economies in not just Sub-Saharan Africa but in the world. Reports state Nigeria is set to overtake South Africa as the largest economy by 2025. Some have their reservations about this projection though. The country is now one of the “frontier-markets”, one of the “Next 11” countries and one of the African “Lions”. It seems investment banks and consultancies are falling over themselves to coin these acronyms. Yet, unemployment persists, 61% of Nigerians live below the poverty line and infant mortality is still one of the highest in the world. 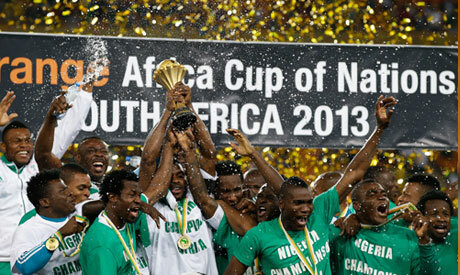 After 17 years of suffering humiliating defeats and since our last victory at a football tournament, Nigeria clinched the 2013 African Cup of Nations. Sadly, the incidence of violent crime has been on the increase in Nigeria since the transition to democracy. Ethno-communal and religious violence, kidnapping-for-ransom, highway robberies, piracy in the Gulf of Guinea, rise of violent militias and the Boko Haram insurgency have dominated the headlines and claimed innocent lives. Our security agencies, especially the Nigerian Army, despite their numerous deficiencies have worked tirelessly in maintaining law and order. They deserve our support and encouragement for risking their lives in protecting us, even if they have also been sometimes guilty of human rights abuses in the course of duty. So, kudos to our armed forces!! Sadly, not much has improved in the way of elections in Nigeria. Since independence, elections are typically preceded, characterised and trailed by fiery political rhetoric, violent competition and brazen fraud. Two videos below capture electoral fraud i.e. multiple vote casting, during the 2011 elections and confusion during the recent election of the Chairman for the Nigerian Governors Forum. In the case of the latter, the video shows a clear winner, different from what was reported in the media which begs the question: if elections involving 36 individuals only could not be conducted in a hitch-free manner, then…? Importantly, we need to remember that democracy came at a costly price for some Nigerians — some paid dearly with their lives for some of the freedom we take for granted today. 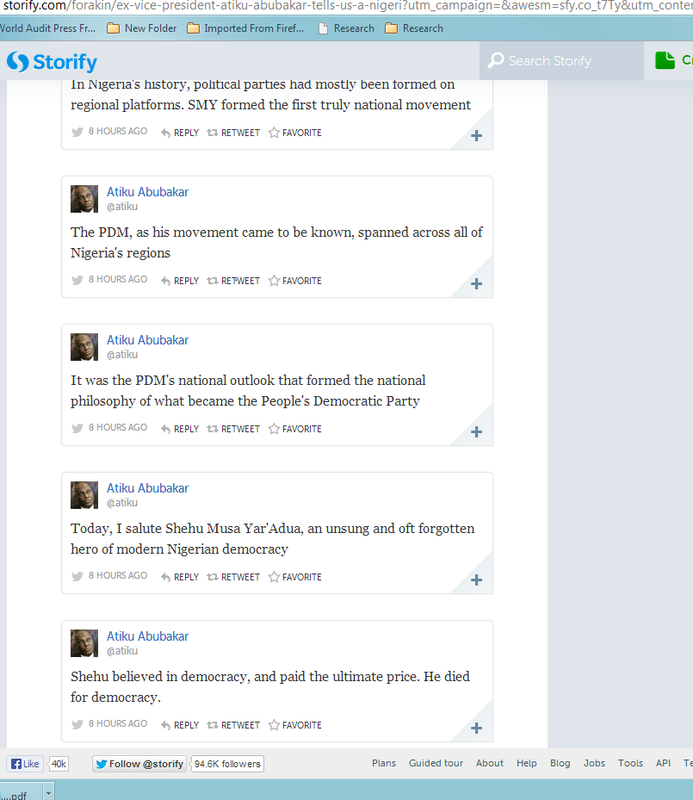 Former Vice-President Atiku Abubakar reminded us of this reality with a series of tweets last night, which have been compiled via Storify HERE. Here is a screen shot of some of the tweets. Despite the hits and misses in Nigeria’s democratic record and its dividends, its important to remember democracy itself is a process, and a journey, towards a better society for all, and not an end in itself. Happy Democracy Day! In as much as I agreed that,democracy is process,I want to put it succinctly forward that, Nigerian especially the youth which make about 70% of the entire population, expect nothing short of glaring massive improvement in core areas, considering the goodwill and faith of Nigerians in making democratic rule work in the country, and resources in which the leaders have at their disposal. Nigerians needs leaders, to fix, the electricity problem, the rail system(fast train all over the country), build new refineries( one in each geo-political zones), Then imagine what the economy would look like. President Jonathan have indeed failed. Is there really democracy to celebrate in nigeria? I think we still have a very long way to go. let us just pray. Is there really democracy to celebrate in nigeria, we still have a very long way to go, let us just pray. that our malls and retailers cater to. Right after cleaning, wipe the tub and shower dry to limit humidity left.